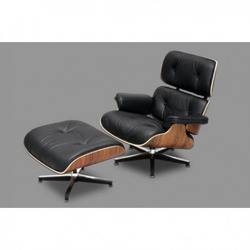 Ottoman and chair genuine leather set, similar to Eames Longue Chair. Suitable for home, office, bar, pub, restaurant, disco, at the best value for money. Dark rosewood frame (with black leather), or Light rosewood frame (with white leather), curved and varnished. Size: Chair 84x84x85 cm. - Ottoman 42x63x56 cm.